The problem is merely the choice of verb and its modifiers, but the image for the reader is something else again. My own phone is smallish and flat, but still I think sitting on it would be sufficiently uncomfortable that I would not want to do it for hours, and if I tried to sit on it for hours I am sure I would have some words to say, most of them unpublishable. Generally I expect that when people sit silent for hours they are thinking (do we still say “lost in thought”?). When I’m really thinking, I stare into space, or doodle meaningless and badly drawn shapes, faces, embellished words…. Yes, I am silent. I come back from these mental excursions with a decision, or a plan, or a tentative idea, or an explosive expression of frustration. When I sit for hours staring at a screen (my computer screen—I’m too penny-wise to do much on my phone other than talk), I may start with a thought or question but generally then embark on a mildly interesting wander-by-click through loosely related sites, stopping from time to time to join in some emotion-laden exchange of “comments” or take some silly algorithm-driven “quiz” or loop back to feed my dog on “Criminal Case,” ending suddenly with the realization that hours have passed and I have no idea how or why. That, I presume, is the kind of “sitting” my student had in mind when he wrote this sentence. And he was lamenting that kind of sitting, as do I. Now, some long-term silent-sitting-on-things can be productive. I’m thinking of the mourning dove currently nesting in the rose vines along my porch roof (I can see her from my window right now). She and her spouse take turns, exchanging their dove whoo-OO hoo hoo hoo only during that process. This is the second year I’ve had mourning doves nesting in this spot, which is hugely popular. Over the last seven years I’ve had two robin couples, one of whom raised four wonderful kids and the other of whom lost their eggs to a night raider; one cardinal couple, nesting on their tiny straw saucer and raising three lovely babies; two couples of house finches, one of whom last year crafted an amazing apartment for a clutch of kids, the other of whom (could it have been the same ones?) moved into it at the beginning of this season to raise a clutch; and three years ago the other mourning dove pair. 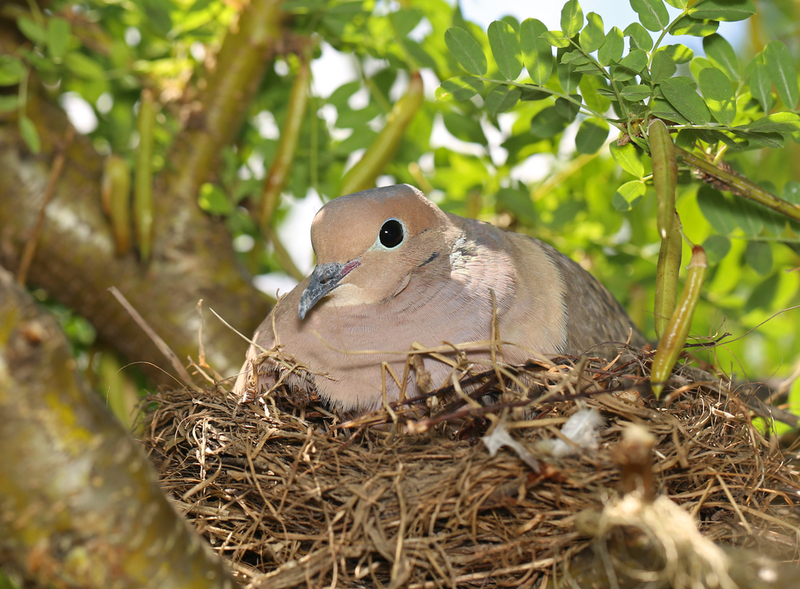 Doves lay two or even three clutches a season, usually in different nests; but this season the happy couple settled back into their original nest two days after the second little squab took wing. With each of these families, I have been moved by their trust, their patience, their tolerance of us and friends (and mail carriers and delivery guys) in our comings and goings, their care of eggs and babies, and the emptiness we feel at their departure. Students surfing other people’s selfies, sending texts (and tweets! ), playing games, reading random stuff, are probably not perpetuating the species or giving anyone else much joy. So I wish my student had said what he meant. What he wrote launched me on a brief but hilarious contemplation of kids sitting like nesting birds on their phones, certainly not comfortable, possibly expecting something to hatch. What a contrast to actual birds, and to the students he actually was trying to describe! My student was unaware that he had written a truly arresting statement, one that might be expressing a deep truth: We all die in a heartbeat, so to speak, or at least we all die with the cessation of heartbeats. He didn’t notice that because it wasn’t what he meant. He was trying to emphasize the nobility of our military, that they would not hesitate to give their lives for the country. That’s what “in a heartbeat” means: instantly, without hesitation. You’ve used the phrase, I’m sure. “I’d marry him in a heartbeat!” “I don’t know why you can’t make up your mind—I’d take a job like that in a heartbeat!” Note the enthusiasm as well as the promptitude conveyed by the image. And I’m sure my student also intended to convey the enthusiasm, or at least ready willingness, of the soldiers. In fact, in terms of its intention there’s nothing wrong with his sentence. But in terms of its expression, what he means as fervent praise becomes comical because the phrasing seems both self-defining and self-contradictory. The hapless reader—or at least the reader for whom words evoke pictures—is bounced out of the essay to contemplate the bizarre vision of soldiers dropping suddenly dead all over the place to protect their country in some unknown way. That’s the problem with formulaic phrases and clichés: they jump onto the page whenever they see the chance, not bothering to pause in the writer’s mind to see if they are truly the best words for the job. And sometimes, as here, they are absolutely not. If only my student had taken the time to see what he meant to say: to picture soldiers unhesitatingly obeying the order to advance into battle, conscious that they might be killed but fully willing to make that sacrifice. That phrasing evokes tears of admiration and pity. For pacifists it might evoke anger against the waste of war. But it would not, for anyone, evoke puzzlement or laughter. I suppose there’s really nothing very wrong about what my student wrote. Of course he didn’t make clear whether he meant the seas were home to the events called “shipwrecks”—waves pounding the sides and decks, winds tearing the sails and bending the masts, rudder snapped, wheel out of control, panicked passengers huddled below, desperate seamen swarming above—or to the objects called “shipwrecks”—wrecked ships lying on the ocean floor, hulls stove in, masts splintered, treasure scattered on the drifting sand, fish swimming through empty portholes, sad skeletons partially encrusted with coral. I suppose if he thought about it he might say he meant both; I’m not sure he gave the question a lot of thought while actually writing, though. Certainly the “rough seas” are places where there are such objects and events. “Numerous” is a rather flabby term here next to a noun of such violence and loss, but “many,” “countless,” “lots of” shipwrecks would be just as flat—and “shipwrecks aplenty” wouldn’t strike quite the right note, would it? So let “numerous” go. What I can’t quite let go is “are home to.” Doesn’t “home” connote pretty much the opposite of despair, death, and destruction? We say New England is home to several august universities that were founded during the Colonial period. California has been home to the film industry since the beginning of commercial movies in America. New Orleans is home to the rich cuisine that is Créole. We might even say, or I might even say, Connecticut is home to me. BUT would you say “Kansas is home to numerous tornados”? or “Cemeteries are home to numerous corpses”? Don’t things have to be alive to come, or be, “home”? Does the Dore illustration below suggest “home” to you, in any way? Figures of speech can become so much a part of our ordinary language that we don’t pause to consider the pictures they evoke, and I think my student was betrayed by familiarity here. Blessed (or cursed) with a very visual sense of language myself, I find his perfectly ordinary statement oddly unsettling, perhaps even morbid. Maybe I’m overreacting on this one. I welcome your comments! 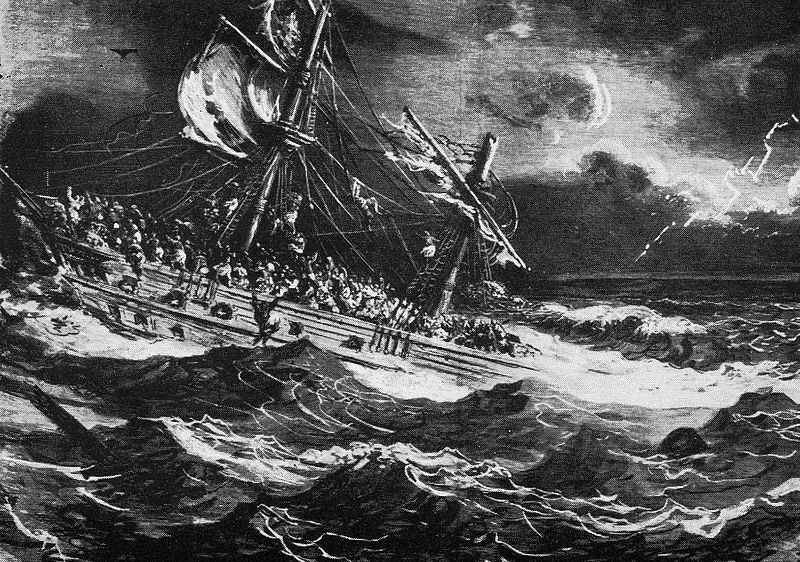 This bleak and terrifying image of a shipwreck is by the great 19th-century artist Gustav Dore; it is an engraving of his impression of the ship in the ballet “Le Corsaire.” Note the rough seas. Pretty homey, eh? Dylan Thomas enjoyed revisiting clichéed expressions, refreshing them to offer his reader new insights, experiences, lines of thought. Phrases such as “a dog among the fairies, The atlas-eater with a jaw for news, Bit out the mandrake with tomorrow’s scream” (“Altarwise by Owl light”) and “Dead men naked they shall be one With the man in the wind and the west moon” (“And Death Shall Have No Dominion”) wake us up with a tug on the bell of familiarity. Sometimes a student error has the same effect. This is one such error. The reader of student papers (as distinct from the reader of a Dylan Thomas poem) must of course first ask: “Is this just a typo?” We can be almost certain here that my writer was going for “long-lost friends,” and possibly all she did was hit “a” instead of “o” and omit the hyphen, a little mark students are generally not comfortable with anyway. The reader silently corrects and moves on. No problem. We knew what she meant. Just as likely, though, is that my student has not heard the expression “long-lost friend” very often; she is, after all, only 18 or 19. How long can friends be lost for if one’s entire life is two decades or less? And if she hasn’t heard the expression very often, she may not have heard it correctly. I’ve looked at a lot of other errors that seem to have resulted from reaching into one’s own lexicon to interpret an unfamiliar term, and this may be one of those errors. She may have misunderstood what she heard. If so, then what intention did she add to the phrase? We get to play with punctuation here, all the “little marks” that group words into concepts. Did she mean “long, last friends”? That is, was she thinking of enduring relationships with people, possibly tall people, who were likely to be among the mourners at her gravesite? For some reason this strikes me as a kind of Dylan-Thomas-y thing to write. Or are we seeing “long-last friends”—those sturdy ones who can be relied on through thick and thin, kind of like Levi’s jeans or Wearever cookware or Firestone tires—? Remember to keep that hyphen in there, though, or you’ll have to be writing from a sickbed or coffin. 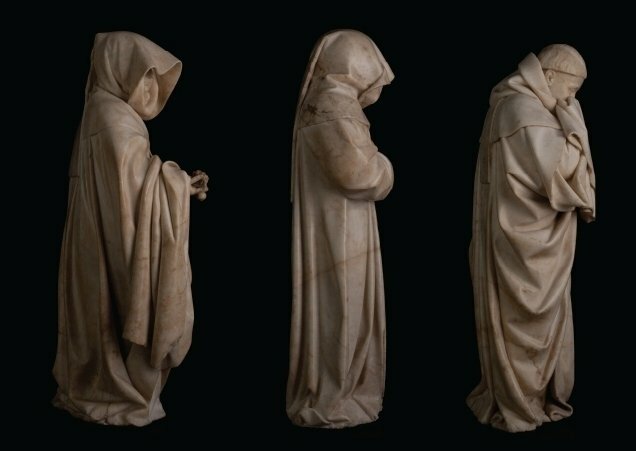 Medieval statues of Mourners—or Long, Last Friends. No reunions here. This image from an article on the exhibit “Mourners” at the Musée des Beaux Arts de Dijon. Reading extensively in an author’s works, or even with deep involvement reading a single work by an author, can lead us to feel an intimacy with the writer that is almost like a personal relationship, albeit one-sided in that only the reader is aware of the relationship. It’s also possible to fall in love with, or develop protective feelings for, a character in a literary work (again, one-sided—alas, if that character is Lord Peter Wimsey and the reader falls so deeply in love with him that no flesh-and-blood man can compete…). But even then, the reader does not begin referring to the writer, or the character, by nickname, in the case of the character, or first name, in the case of the author. In an earlier time, not even the characters called each other by first name: how late in Pride and Prejudice before Elizabeth Bennet permits herself to call the man she comes to love anything but “Mr. Darcy,” for instance? Students, on the other hand, seem to get chummy very quickly with the characters and authors they read, blithely throwing protocols to the wind. At its most extreme, this practice can blow a student to some pretty strange places. I once had a student who wrote that her favorite composer was a German gentleman called Bay Toven. (Evidently she knew of him only by way of her ear…) After the first sentence, she referred to him for the rest of the paper simply as “Bay”: “Bay could not hear his own music, being unfortunately deaf.” This was, remember, her favorite composer. On a side note, I have to mention that some students don’t use any kind of name for their professors. In the last few years I have received many emails that begin simply “Hey.” I might not mind so much if they went on, “I just had to say THANX for that great class!” But they rarely do; usually it’s “I lost the syllabus, so could you send me another one?” or “I worked hard on that paper and think a C is too low of a grade.” Yeah, Hey. But let’s get back to Phillis. “Phillis” is Phillis Wheatley, a serious and delightful poet of the eighteenth century, the second published African American and first published African-American woman. Named Phillis after the ship that brought her from Africa as a slave, and Wheatley for the family who bought her in Boston, she showed aptitude for classical languages and literature at an early age, talents the Wheatleys supported and helped to develop. She was freed at their death, but had never truly been treated as a slave while with their family; they had even traveled to England for her sake because they thought she had a better chance there of being recognized as a writer. My students expect protest poetry from her, but what they read instead is elegant verse in the forms and styles popular at the time, and expressions of gratitude for the life she lived. Would you refer to her as “Phillis”? He’s chosen a word that’s doubly wrong: the one he’s written doesn’t mean what he thinks it does (and is completely bizarre when used with Cain! ), and the word he thinks it is shouldn’t be used that way either. But I may be the last living objector to the use of “reference” as a verb, and especially as the kind of verb he’s trying to use. What ever happened to words and phrases such as “alludes to,” “refers to,” “makes reference to,” “mentions,” “points to,” “compares…with”? I know English is a living language, but “references” as a verb seems to have swept all these other, more traditionally correct, terms suddenly away. I hear it from the mouths of scholars as well as the mouths of babes; it peppers academic papers so thickly as to cause sneezing. Why it caught on I cannot say, unless it just sounds so intellectual? or is so lazy? or maybe both? Neither of these definitions describes the usage employed by my student (and so many, many others). But I’m afraid that this is yet another battle I am doomed to lose. Once an error or grotesquery becomes widespread among multiple classes of users, one aging prof, armed with no matter how mighty a sword, can’t withstand it. I fear it is too late for the blithe users of “reference” as a verb to have their sin refined away, because far from recognizing it as a sin, they hold it in an unbreakable embrace—yea, reverence it. I’ll just have to try to become deaf to it. Like Bay. Factually accurate, somewhat patriotic in tone but not jingoistic: what’s your problem, Teach? Everyone who has ever studied a language is acquainted with the term, or at least with the concept, idiomatic—or, as that language-instruction book Mark Twain rejoiced in would put it, “English as she is spoke.” A language as it is spoken by its own people will always contain some phrases or grammatical quirks that cannot be directly translated, or that defy parsing. Instances of this are generally referred to as idioms, and the language as used by native speakers is referred to as idiomatic language. You usually can’t learn it from a textbook. I knew what my student meant—The Revolution established the United States, where no landlord took the profits of the peasant’s toil. See, for instance, the arrangement that was already in the process of being put into place so effectively in Ireland, the landlord-tenant system that would exacerbate the “potato famine” there in the nineteenth century, like the feudal system that had maintained such sharp social and economic divisions in much of Europe throughout the Middle Ages. The worker toiled and sweated; the landlord (or the lord) took the profits and lived large. So throwing off the yoke of England meant throwing off all vestiges of the feudal system. What my student meant to say was that every man was entitled to the fruits of his own labor. Every man was entitled to benefit from the sweat of his brow. And he almost did say that. The problem, of course, is that word “own.” When “own” joins the sentence and insists on modifying “brow,” a secondary idea creeps in with it. No longer is the student distinguishing who benefits from the sweat of a man’s brow, distinguishing between legitimate beneficiary and the implied illegitimate beneficiary, the “lord” of the English system; now he is identifying whose sweat constitutes the benefit. So here’s the picture I get from this disfigurative language: Said farmer pauses in his plowing to mop his brow. In dashes a representative of the King of England, who snatches the handkerchief: “This sweat belongs to the King! Carry on!” If he’s a generous representative, he may have brought a soggy piece of cloth with him: “Here! This is John Doe’s handkerchief. This sweat’s for you!” And the farmer, saved by the Revolution, staunchly replies, “No! I am an American! That is MY sweat, from MY brow, and I’m entitled to it!” Fifty Minutemen emerge from behind the bushes, muskets at the ready, to support him, and the King’s representative skulks off (perhaps resigned to giving the King the sweat of John Doe’s brow instead). Who gets the actual fruits of his toil seems too unimportant to mention. My student is writing about the missionaries that tried to take what they considered the Word of God to Native American tribes. He’s using the term “savages” because that’s the term frequently used in the Christian literature, especially the Puritan literature, that discusses the indigenous peoples of New England. In American Literature I, we have read a lot of this literature, and also some of the eloquent testimony and commentary of Indian leaders. My favorite is the reply of Red Jacket, an orator and negotiator of the Seneca people, to the Massachusetts missionary Joseph Cram in 1805: “BROTHER: We do not wish to destroy your religion, or take it from you. We only want to enjoy our own.” If only people in the 21st century could think like that! It is perhaps unfair to take a sentence from a midterm exam for discussion here, but what interests me is not the relatively minor writing error, which should probably be excused on a test; it is the shining evidence of a tin ear (or a blind mind’s-eye), the kind that afflicts people writing under pressure. We’re not talking friendly persuasion! The actual error is the number disagreement between “savages”/”their” and “face.” Attending to the plural might have made my writer pause and rethink his cliché. But he did not notice the mistake, and so he gave me a moment of hilarity in the midst of my midterm tears. “Don’t throw that in my face,” we say, when someone we’re arguing with refers to a past gaffe or stupidity and thereby scores a point. I think that’s the principal usage for this phrase, isn’t it? If so, it’s not the cliché my student should have chosen (as long as he was determined to choose a cliché at all). Still, any reader knows he wasn’t speaking literally: we have no record of someone actually throwing Bibles at Indians, nor would my student have tried to claim anyone actually did. He just meant, I’m sure, that missionaries and others pushed the Christian message again and again, unremittingly, brooking no protest and engaging in no debate—for the “savages'” own good, assuredly, the missionaries must have believed. Still, I did laugh at the ridiculous image, the cartoon that flitted across my mind’s eye, Chingachgook throwing up his hands to protect himself from the barrage of airborne Bibles being flung by the hot-eyed, high-collared holy. Well, we would all have been better off if the only ammunition had been Bibles. Still a spiritual assault, true, but causing much less bodily harm, and less permanent harm, than the bullets from the muskets of settlers and the rifles of soldiers. But the way this student uses the phrase, the figurative language loses its poetic dimension and offers only a bizarre picture to us: Sonny is busy out back digging his own grave, and Dad doesn’t want to watch. I’ve written frequently about the case of the ex-pro football-playing father killed his son to save him from the miseries of drug addiction. Students grappling with this case do tend to get lost in verbal tangles. Figurative language offers itself up on the sacrificial gridiron and is scorched beyond recognition. This example is just one of many. Here, my student was right: the father believed his son, who had quit high school varsity sports and spent most of this time lying in his room listening to music and smoking marijuana or drinking “cheap wine,” was dooming himself to a slow and horrible death in some skid-row crack house. The son refused all offers of help with his “problem,” and of course Dad believed that the end was inevitable. Sonny was digging his own grave with his drop-out tune-out behavior. But my student’s earnest desire to emphasize this parental fear and filial self-destruction literalizes the sentence. Suddenly, Sonny is in the backyard digging his grave, and Dad is standing by the kitchen window, occasionally peeking out and then pulling the curtains closed again, not wanting to watch the digging. Clearly not wanting to watch. As a parent, and all.